Our bell sleeve tops are selling out quickly. Grab them before they're gone! 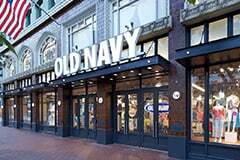 Assemble a signature new look with fabulous bell sleeve tops from this inspired line by Old Navy. Are you looking for a great new blouse that will help you create stunning new outfits? Look no further. With these amazing ruffle sleeve tops from Old Navy, you'll have no trouble whipping up a striking look. These fantastic garments feature elongated, bell-shaped sleeves that are airy and fun, while also being elegant and attractive. Choose from a variety of styles, including full-length sleeves and quarter-length tops. Popular off-the-shoulder shirts are always a hit, while tie-neck shirts have their own fun vibe. Shop this radiant collection today and find a charming top that speaks to your individual personality and tastes. 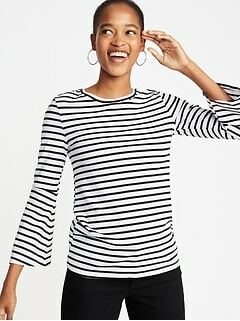 Flared sleeve tops from this fine line at Old Navy are unique creations that will stand out the moment you step into a room. They are friendly and approachable, but still bold and vivacious. Choose from an assortment of lovely solid colors, floral prints, striped patterns and much more. From blouses to sweaters, there are plenty of exceptional tops available featuring this sleeve style. Manufactured from soft fabric and tailored for a great fit, you'll find must-have apparel in this line for anything on your agenda. Whether you're planning an outfit for date night, meeting up with friends for a quick lunch, or spending your day off shopping, you'll find it's easy to create a one of a kind look with these tops. Ruffle and flared bell designs will pair wonderfully with your best skinny jeans or a sophisticated pencil skirt. They're easy to work with, and will help you come up with fashionable new outfits. 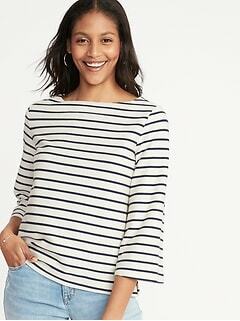 Add these fine tops from Old Navy to your wardrobe today, and discover possibilities you never knew existed. With flute sleeve tops from this selection by Old Navy, you'll have an exceptional option for any setting.